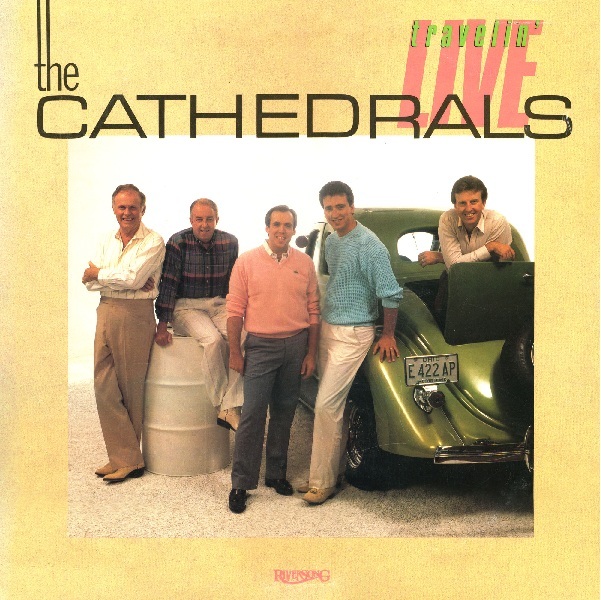 Here’s a blurb: I never saw the Cathedrals live (I didn’t even really know who they were until well after they had retired), so live albums and videos are the only ways that I can know in a small way what it was like to sit in front of them and watch southern gospel mastery at work. The popular sentiment may be that Live…in Atlanta is the Cathedrals’ greatest live recording, and I understand why, but for me, it has always been Travelin’ Live. It features my favorite lineup of any quartet of all time, doing what they do best. George Younce may have been the greatest emcee in gospel music history. Danny Funderburk could bring the house down at any moment. Glen Payne quietly went about his business singing a perfect lead. Mark Trammell was solid as a rock, hitting whatever notes were required of him, high or low. And Roger Bennett backed them all with the ultimate in classy, yet skillful, accompaniment. Travelin’ Live was not a recording without mistakes: the big one on “Boundless Love” is well-known, and was fixed, while the one on “Come on Home” wasn’t. (EDIT: this error is probably only on the video) But it all seems very real, putting the listener right there in the auditorium, and that’s exactly the purpose of a live album. It’s a thrilling listening experience, repeatedly taking you up to heavens with energy, then bringing you back down to a calmer, pensive state, then back up again. Even after listening a hundred times, I can’t help but be carried away into the flow every time. This album is one of my earliest memories of SG music and is probably the very first project I ever owned. A friend had give me the cassette when I was about 10 years old and I absolutely wore it out. We are alike in that this was my favorite quartet lineup of all-time. Looking forward to seeing the remainder of your list! You know, I just noticed for the first time that Danny Funderburk is in the trunk of that car. Are you sure that Danny isn’t in what was called the ‘rumble seat?” We had an old Packard that had one. What was the mistake on “Come On Home”? I can’t remember. I don’t have the testimony from Mark and the missed words on my copy of the cassette. I pulled it back out to listen again, but it is on the video. You know, now that you say that, the audio I have of the album is actually what I ripped off of the DVD. Now I’m thinking the album/cassette may not have had the testimony/repeat verse. Anyone else got some input here? I edited the post to reflect that the “mistake” on “Come on Home” probably only made the video. I can’t believe I forgot that the audio I am working with is actually from the video. It’s been a while since I ripped it. I’ve been trying to find the DVD of the Travelin Live of the Cathedrals. Everyone that says they have it, I never get it because it’s always on a backorder status or I never hear back from the seller. Where did you find your copy? Do you know of a website that may sell out of print of hard to get Southern Gospel music? I tryed http://www.GEMM.com but the only seller that had 18 new copies has never confirmed my order since 1/2/14. Just really want to get this for my husband and have looked everywhere I can. My husband subscribes to the THE SINGING NEWS MAGAZINE. Darlene, I don’t remember exactly…I probably got mine from either Amazon or eBay. I don’t remember it being a difficult find then, but it appears that it is now. Hope you have success! It was one of the best live Southern Gospel albums recorded on Riversong Benson label in the 80’s in 1986. I believed it was heavily dubbed and mixed. And after watching the video, mistakes where made, but dubbed out on the album release. This ranks right up there with three other live recordings on the Riversong Benson Label, that was once known as Heart Warming Label, and Vista Records in the early 70’s. The other three would be Singing Americans-Live and Alive in 1984. Gold City-Double Take Live-Charleston South Carolina-1986. Kingsmen Quartet-Jackson Mississippi Live-1987. All recorded on the Riversong Label, went out in the 90’s. The record company had a lot of great artist over the years. Oak Ridge Boy’s Quartet, Naoami and The Sego’s, Cathedrals, Singing Americans, Gold City,cand the Kingsmen, to name a few.